Reusable Anodized Aluminum cleaning pads by Goodbye Detergent for your kitchen & appliances. All you need is a little water & elbow grease _ let the cleaning pads do the heavy work! 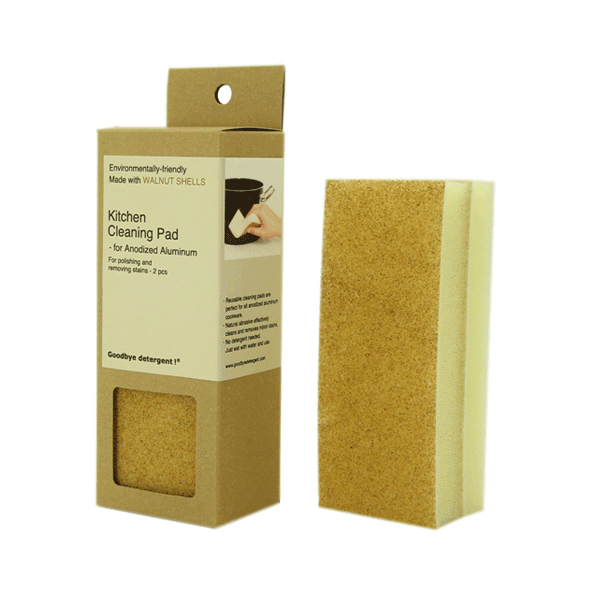 These cleaning pads make a great addition to eco-friendly household cleaning products & kits. Please note: Anodized Aluminum pad sold as set of two. Each pad is made from sustainable and environmentally-friendly materials. Additionally, they're so durable and strong that each pad will save on cheaper scrubbers that wear out faster and is designed to work without detergents that often contain harmful chemicals. Removing minor stains from anodized aluminum cookware, other side is for general cleaning & polishing. Moisten with water, roll up into a ball and only a dab of soap if desired. Scrub will get softer with use. Rinse and hang to dry thoroughly after each use. We suggest trying abrasives on an inconspicuous area first since all materials can vary. All scrubs are reusable and need to be replaced when you feel there isn't any abrasive left or a decrease in effectiveness. Soap isn't necessary; however, we do recommend using a little soap when tackling grease or oil. Goodbye Detergent is the award-winning line of environmentally friendly cleaning scrubs for your home, made with recycled materials like walnut shells, pumice stones and plastic bottles. Designed by industrial designer Hiroki Hayashi, these scrubs are unique, long-lasting and will change the way you clean.